Unhappiness is a form of self-indulgence. A little abstract, but it is true. You may need to think deep and hard about it, or you may get it immediately (I needed a bit of thought!). 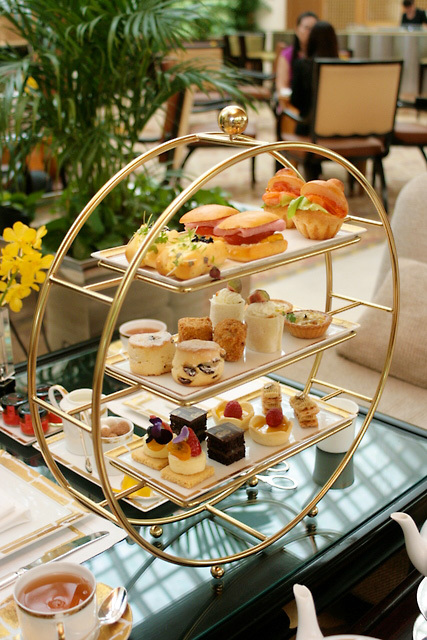 A luxurious afternoon tea at the Ritz-Carlton is also a form of self-indulgence, but this one is clear to see. Well, for a spot of indulgence, I quite readily picked the tea. This was not just self-indulgence but a shared indulgence. A couple weeks back, Julia and I decided to play "tai-tais" for an afternoon, complete with high tea. Hey, just FYI, we actually do work; just not in an office, and not following office hours or getting substantial remuneration or benefits. So this was a real treat for us. 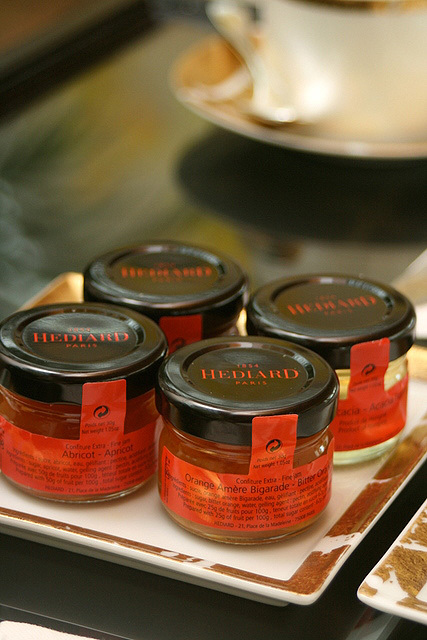 Right after settling into those thick, plush comfy chairs, we spied the little jars of Hediard jams. Already a splendid start. You get to choose a pot of Bernadaud gourmet tea each, and you can change the tea as often as you like, or opt for coffee. Waitresses clad in gold and black glide around discreetly, always refilling your cup whenever it gets empty. The nibbles. This set is for two. It's not a lot of food, we noticed, but when savoured slowly with tea and good conversation, these can go a long way too. 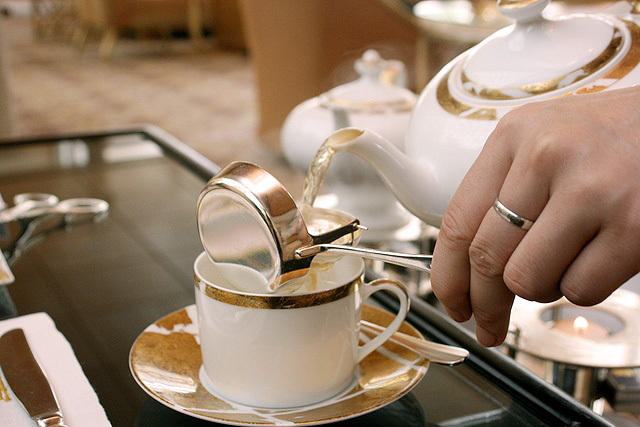 I love the golden circular tray holder; it's dramatic and elegant at the same time. They probably vary the items from time to time. But this is what we got that day. 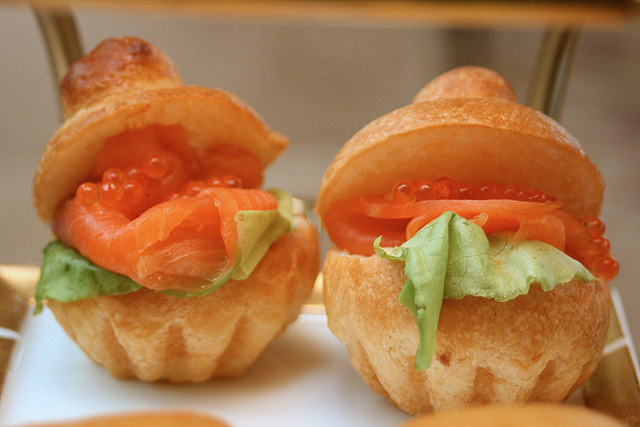 For sandwiches, there was an egg mayo and caviar on herbed bread, pastrami with tangy tomato on tomato bread and smoked salmon with roe on brioche. Don't these just say "Eat me!" with their open mouths? 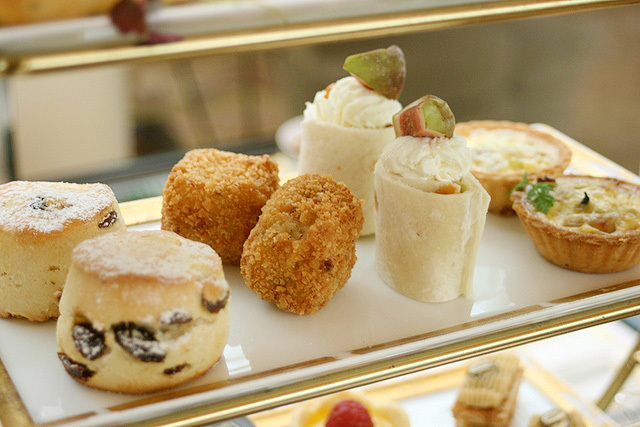 The second tier gives you raisin scones, crab croquettes, chicken and fig rolls, and mushroom-potato quiche tarts. Even before we finished these, we were feeling a bit full already, from the sandwiches and tea. The dessert tray yields cheesecake, chocolate cake, lemon custard tart and coffee cream mille feuille. The custard tart tasted like it had salted egg in it! That fragrance only comes out when you eat BOTH the custard with the pastry, but not when you test them separately. Quite intriguing. Tea stretched a leisurely three hours, and yet it seemed like time flew as we chatted and savoured the little bites. 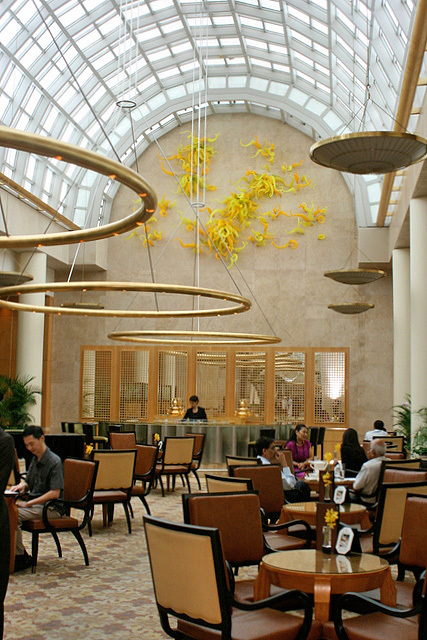 Chihuly Lounge is airy, well-bathed in sunlight and surrounded by greenery you can view through the large windows. Something about it is quite relaxing. We soaked it all up and thoroughly enjoyed ourselves. Sometimes I feel how much you enjoy something is up to you, and what you choose to focus on. 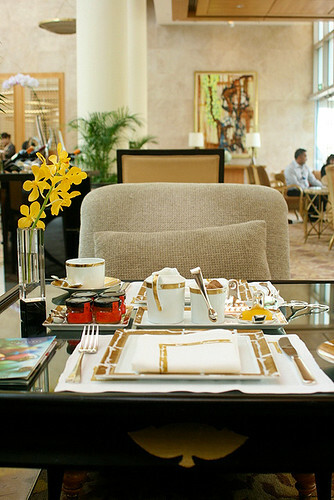 This afternoon tea (S$36++ per person) was pretty damaging to our skinny wallets. Some may feel it may not be value for money, given the limited tangibles you get. But for us, we felt the whole experience was lovely and worthwhile. Will we be back? Honestly, no, because there are just too many other teas to try out! P.S. 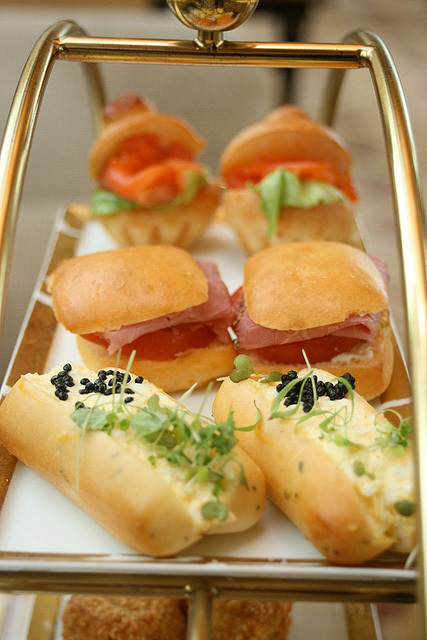 Please note that this is the Traditional Afternoon Tea on weekdays (2.30pm to 5pm). On weekends, they have a buffet (more Asian-style food). 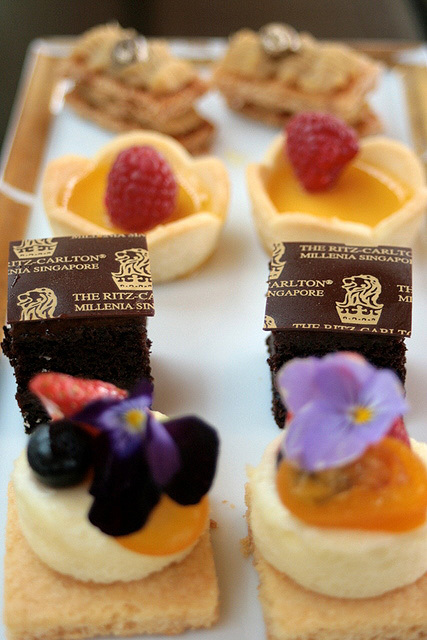 I'm also adding this review to my High Tea Buffet and Afternoon Teas List. One down, many more to savour! I agree with your assessment. While the presentation makes the food looks somewhat interesting and the surroundings are nice, $36++ per person is way too overpriced for what you get. 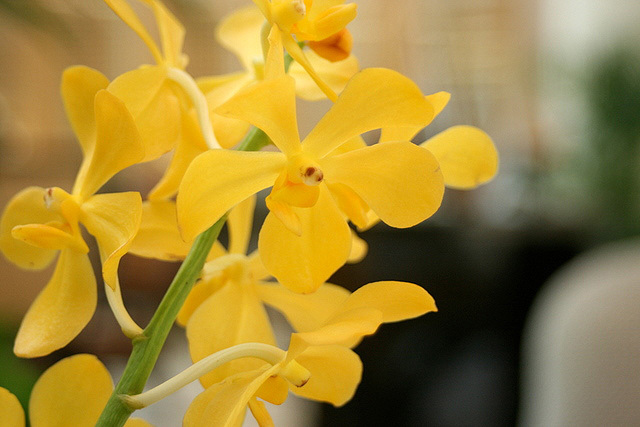 I have seen much better quality and value, and much more interesting high tea options which you have reviewed in your buffet section. Thanks for reviewing this restaurant...I'll be sure to stay away from this place when it comes to high tea, even if someone else is footing the bill. Happy Earth Day and the Infinite Book Exchange! Dinner with Ian Wright as he goes Out of Bounds!